The implementation is quite simple: VerticalTextBlock exposes a Text property of type string, the VerticalTextBlock Template contains a TextBlock, and that TextBlock is populated with a series of LineBreak-separated Runs containing one character each. At the end of the day, VerticalTextBlock is a simple control I wrote to keep myself honest. :) I figured it could be useful to others, so I'm posting about it and attaching a ZIP file with the complete solution+projects so anyone who's interested can try it out! 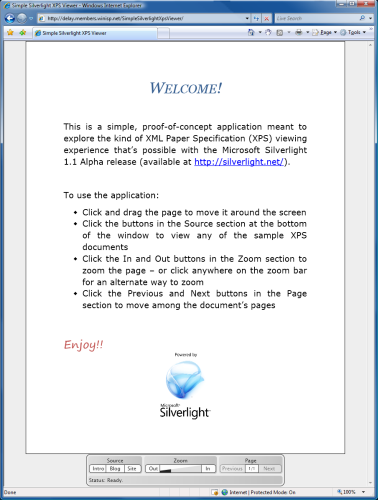 Earlier this week I was asked about an update to my SimpleSilverlightXpsViewer sample for the newly released Silverlight 2 Beta 2. (Background reading: Introductory Post, Beta 1 Update.) I spent a bit of time on this just now and migrating SimpleSilverlightXpsViewer to Beta 2 was very straightforward. I've updated the SimpleSilverlightXpsViewer demonstration page and also the source code download, so you can try things out in your browser and/or download the code to see how it works! DependencyObject.SetValue no longer seems to automatically convert the type of its value parameter, so there were three places I changed an int to a double for consistency with the underlying DependencyProperty type (ex: "0"->"0.0"). The "disappearing page border" issue that showed up in Beta 1 still seems to be present in Beta 2, so I worked around it by changing the "pageGraphic" from a Rectangle[Fill/Stroke] to a Border[BorderBrush]+Grid[Background]. A web search turned up a couple of customer reports of this behavior for Shapes (Path, Rectangle, etc. ), so it should be fixed for the final release of Silverlight. 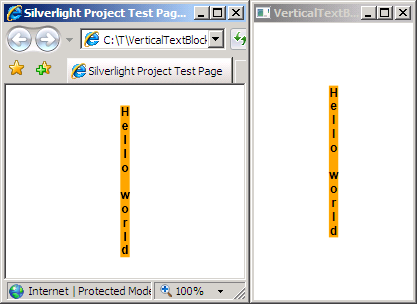 A customer recently asked about an update to my HtmlTextBlock sample for the newly released Silverlight 2 Beta 2. (Background reading: HtmlTextBlock Announcement, Improvements, Beta 1 Update, Data Binding Support) I'd meant to eventually migrate my samples anyway, so HtmlTextBlock seemed like a great place to begin! I've updated the HtmlTextBlock demonstration page and also the source code download, so you can try things out in your browser and/or download the code to see how it works! InitializeFromXaml was removed from Beta 2, so HtmlTextBlock now uses XamlReader.Load to set the equivalent Template in its constructor (and uses OnApplyTemplate to get a reference to the contained TextBlock). Some of the properties HtmlTextBlock used to explicitly expose for TextBlock compatibility have moved to the Control class (from which HtmlTextBlock derives) in Beta 2, so HtmlTextBlock no longer implements them itself (ex: FontFamily, FontSize, Foreground). 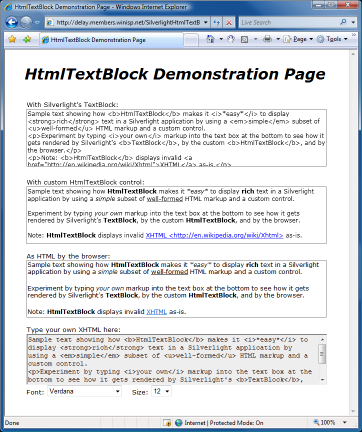 A handful of TemplateBindings are used to bind these properties of the Template's TextBlock to the corresponding properties on HtmlTextBlock. The parameter list of DependencyProperty.Register changed slightly in Beta 2 and PropertyMetadata is now used to wrap the PropertyChangedCallback parameter. Special-case code for setting certain values of TextBlock.LineHeight is no longer necessary in Beta 2 and has been removed. The unusual "text disappears for certain font/size combinations" behavior that was present in Beta 1 has been fixed by the Silverlight team for Beta 2. As you might expect, migrating HtmlTextBlock to Beta 2 was fairly straightforward. The majority of the changes arose because it tries to be a TextBlock and some of the text properties shifted around. (Incidentally, I wouldn't expect most applications to bump into this at all.) I hope people find the new sample useful as they come up to speed on Silverlight 2 Beta 2! Silverlight 2 Beta was released earlier today and one of the big changes is the switch to using Visual State Manager for control design/development. Another is that many of the core controls (Button, ListBox, etc.) have moved from the SDK into the Silverlight runtime itself (which nicely avoids the need to include them with every application download). I wanted to be sure that SilverlightDefaultStyleBrowser (background reading available here and here) worked seamlessly with Beta 2, so I made a few quick changes to help users explore the new stuff. The version number of SilverlightDefaultStyleBrowser always appears in the window's title and the latest release number is 1.0.3079.23243. (Note: I haven't updated the original screen shot which shows the introductory version number.) If installed with ClickOnce, the application should automatically prompt you to upgrade once it detects the update (which typically happens after running the app once or twice). If you're using the standalone EXE then you'll need to update manually. For people who might not be able to upgrade to Beta 2 immediately, there's no need to worry because the new version works with the Beta 1 bits as well. The change I knew I wanted to make was the default search path for control assemblies. In Beta 1, nearly all the controls were part of the SDK, so that was the only place SilverlightDefaultStyleBrowser looked. But with Beta 2, the core controls are part of the Silverlight runtime and are located in the runtime install directory. SilverlightDefaultStyleBrowser now automatically imports assemblies from both locations when it loads. The header text changed from (for example) "System.Windows.Controls.ListBoxItem" to "System.Windows.Controls:ListBoxItem" to better communicate that ListBoxItem came from the System.Windows.Controls assembly (vs. being part of that namespace (which is not always be the case)). If you compile the source code yourself, you may get a compiler warning from the ClickOnce settings in the project files: "Unable to find manifest signing certificate in the certificate store.". Despite turning off ClickOnce manifest signing, it seems to have gotten turned back on somehow. To make the warning go away, it should be enough to go to the Project's Properties page and uncheck the "Sign the ClickOnce manifests" box on the Signing tab. However, I found that unchecking that box didn't always do the trick - what worked for me was to check that box, use the "Create Test Certificate" button to create a dummy certificate, and then uncheck it.